Continuing our mens theme this week, here are a few assorted cards I have made for the men in my life. I found this beautiful old book at a book sale filled with illustrated plates of The Rocks area in Sydney NSW. The book itself was beyond repair so the sketches now live on in cards. I thought I would share some mens cards with you this week. I made this first card for my nephews birthday using his local n lawn bowls club as the theme for his Flippen Mens card. I found the most perfect verse for it but unfortunately I do no not now the authors name. As we started the week with a miniature I thought we would finish with one as well. 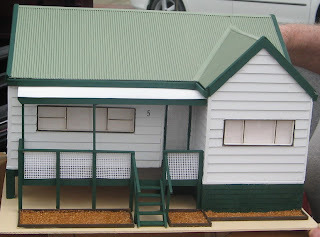 This a replica of my brothers home which Ron built for him as a birthday gift. I hope you have enjoyed my blog this week. Please come back soon. Today I have a tutorial for three Funky Frames . 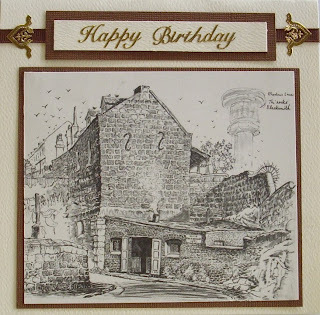 I started with a Kaisercraft frame kit however you could use any frame of your choice. I made this card using a Card Mad Fairy image. We had our Create and Chat night at Craft Mad last Friday night. We worked with acetate and made a Shaker Box card and a Floating Image card. As a bonus for the ladies attending we also had an extra acetate card for them to make . These are the cards that I made. Our next Create and Chat will be held on June 3rd when we will make a cute handbag. 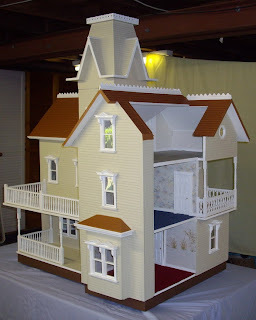 To start the week I would like to share a miniature house built by Ron. I really hated parting with this one but was so happy that it went to a little girl who I am sure will treasure it. I made this Flippen Mens Card for my nephews 30th bithday . I enjoy these 3d images. There seems to be one to suit all occasions. The May monthly swap at Craft Mad was to make Easel cards for your partner . These are the cards I sent to my partner. I have used the new Creatables Bird Cage die and the Bird of Paradise die fromhttp://blueedgecrafts.com.au for the first card . The second one is made using the new Creatables Cup Cake die, Spellbinders Wonky Rectangles and the eCraft for the greeting. Another cupcake project to show today. 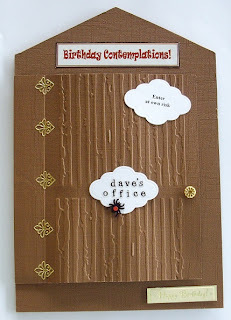 I made this birthday board using a Kaisercraft kit, Birch paper, chipboard alphas and Cuttlebug words. I have combined my passion for bears and the beautiful craft of egg decorating for this project. I bought this as a kit on a trip interstate some years ago and it has remained another favourite of mine. The bear is pure wool and his body is an ostrich egg. I hope you have enjoyed my blog this week . Please come back soon. This is one of my favourite eggs. Ron cut and joined the eggs to resemble a circus tent. We added ceramic clowns to each tent. The front of the board shows the circus animals, merry go round and ticket box and gate. We recently donated this egg to our local hospital to hep raise funds for the Cancer Clinic who care for Ron so well . Todays projects are decorated 6" x 6"canvases to hang in a group on the wall . I painted the canvases, covered the front with patterned paper and decorated with flowers flourishes, ribbons and some inspirational words. Our Create and Chat night was held over at Craft Mad last Friday night. our projects were a Mothers Day Card and a Chocolate Box Card . These are my finished projects. Our next get together will be on 20th May. 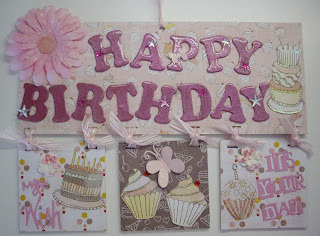 Our next Create and Chat will be tonight and we will be making two cards for Mothers Day. Thak you for visiting my blog this week. I hope you have enjoyed my craft and please come back soon. I made this card using Spellbinders Nested Lacey Pendants, Spellbinders Floral Doily Accents and Spellbinders Doodles. I think this will be a very versatile die and looking forward to creating a banner of some sort with it.